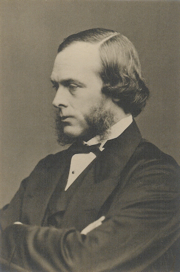 Welcome to the online exhibit on Dr. Joseph Lister, the father of antiseptic surgery. Lister revolutionized surgery in the late 19th century by introducing antiseptic methods. These drastically reduced the incidence of infection and death, enabling the field of surgery to expand rapidly. Until the late 19th century surgical interventions were extremely risky, with approximately 35 per cent of all amputation cases succumbing to infection caused by unsterile practices. The cause of infection was poorly understood. Some believed diseases were spread by bad air (miasmic theory), while others thought they were transferred by something in the air or on the body (contagionism). Only when Pasteur proved germ theory in the 1860s was the cause of infection explained, but it was not accepted by everyone. Lord Joseph Lister (1827-1912) received his medical degree and a fellowship in the Royal College of Surgeons (London) in 1852. He spent his first years of training under Dr. James Syme in Edinburgh, where he began to consider the relationship between infections and exposure to the air. In 1860 Lister moved to Glasgow to become Professor of Surgery. He was also made a member of the Royal Society in 1860. After reading Pasteur, in 1865 Lister began his experiments with carbolic acid and published his findings in 1866. He continued his work on antisepsis after returning to Edinburgh, in 1869, to accept the position of Professor of Clinical Surgery. Lister moved to London in 1877 to become Chair of Clinical Surgery at King’s College, his alma mater. In 1897, Lister became the first surgeon to be made a peer. How did Lister transform surgical care? Dr. Joseph Lister revolutionized surgery in the late 19th century by introducing antiseptic methods that drastically reduced the incidence of infection and death, dramatically improving patient health while enabling surgical knowledge and approaches to advance rapidly. Scroll through the slideshow below to view artefacts and images that represent and reflect Lister’s remarkable surgical breakthroughs that changed surgical care forever. Online exhibit on Sir Joseph Lister developed in collaboration with the Museum of Health Care at Kingston. Lister’s antiseptic system, explained first in The Lancet in 1867, relied on carbolic acid as an antiseptic to exclude airborne infection. This was achieved by packing and covering wounds with lint and gauze soaked in carbolic acid, then layering these with tin and plaster. The result was a 15 percent reduction in post-surgical infections. Lister’s system was well received in Europe, but widely critiqued in Britain. By the 1880s, though, declines in the rates of post-operative infection were convincing many of the benefits of antiseptic practice. Photo: Operation using Lister carbolic spray from Antiseptic surgery. National Library of Medicine, History of Medicine Division, #A013357. After learning that carbolic acid had been used successfully to treat sewage in Carlisle (England), Lister selected carbolic acid as his favoured antiseptic. Although he was not the first to discover carbolic acid, he popularized its use in the medical field. Photo: Carbolic Acid Bottle (c.1890), Museum of Health Care, #010020404. In 1871, Lister recommended that a carbolic acid solution be sprayed in operating rooms during surgery to kill the bacteria in the air around the surgical site. Over 10 years, Lister experimented with different atomizers to perfect the distribution of carbolic acid solution around the surgical site. A donkey engine (pictured here) mounted the atomizer on a tripod and was easy to use, but difficult to transport. Photo: Lister’s donkey engine. Wellcome Library, London, #V0027898EL. The steam sprayer (above) was the ultimate solution, because of its ability to create a sizable vapour cloud with minimal effort. This method was used until 1887, when Lister renounced it based on findings that most air-borne bacteria were not pathogenic, nor removed by the spray. Photo: Carbolic Steam Sprayer (c.1900), Museum of Health Care, #997002442. Lister continually sought to improve his antiseptic system, experimenting with different dressings and antiseptic solutions, as well as testing the potencies that would keep germs out of the wound but not irritate the skin. Antiseptic putties and lac plaster coatings were tried before Lister discovered muslin gauze infused with carbolic acid and paraffin. Photo: Lister’s Carbolized Gauze. Wellcome Library, London. Lister also created carbolized catgut in 1866, an antiseptic suture that is absorbed by the body. Previously, sutures had been conduits to infections because the ends were left long to facilitate removal. By soaking the catgut in antiseptic (top image) and cutting the ends short at the knot, something possible because the sutures did not need to be removed, Lister’s sutures prevented infection. Photo: Creative Commons Catgut in carbolic oil prepared by Lister. Wellcome Library, London. Lister strongly promoted the use of instrument sterilizers, such as the one above from 1883, which cleaned instruments as they were dipped into an antiseptic solution. He also supported the aseptic method of steam sterilizing instruments because it achieved the ultimate goal of eliminating bacteria. Photo: Instrument Sterilizer (c.1883), Museum of Health Care, #997037046. Lister argued that instrument design and materials should facilitate sterilization. He spoke against the use of porous materials, such as woods and ivories, in favour of metals. The two amputation saws shown here demonstrate the change in materials and elimination of decoration that occurred after the antiseptic revolution. Photo: Amputating Saw (1840-1880), Museum of Health Care, #1997.2.11. Charriere’s Amputating Saw (1900-1930), Museum of Health Care, #1977.5.9. Aseptic practices were introduced first in the 1880s, and include thermal sterilization and the use of surgical gowns and masks to exclude surface-born germs. Lister believed that both anti- and aseptic practices were necessary for the safety of the patient. He sought to kill germs that had entered the wound, as well as to exclude germs from the site — a practice continued today as physicians and surgeons incorporate both into daily practice. Photo: Surgical Gown (1921), Museum of Health Care, #1981.10.2. Despite agreeing with some aseptic methods advanced in the 1880s, Lister never supported the use of surgical gowns, masks or gloves. Rubber gloves and gauze masks, such as the one pictured here, only rose in popularity at the turn of the twentieth century. Photo: Face Mask (1910), Museum of Health Care, #1972.15.81.